There are some apartments that seem so well put together, that nothing could disrupt the good energy that flows around them. And we've found one such example of style and class, right here! 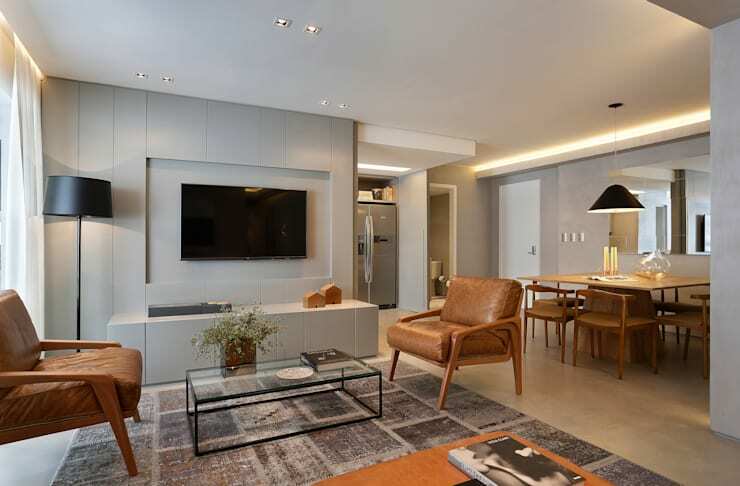 The interior designer that curated this project had such a good handle on how to use understated motifs and classic furniture pieces in order to create a welcoming ambience and easy, luxurious feel. And we know that you'll be shocked by how cohesive every room feels. From the super sleek kitchen through to a fun and engaging kid's room, this is an exceptional home, so let's take a look! Can we all just sit back and enjoy the lovely neutral tones here? 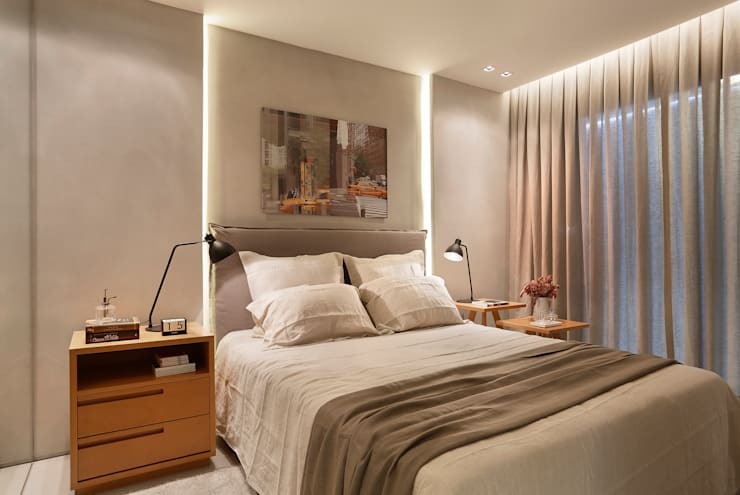 So calm and relaxing, they naturally lend a luxury edge to this room. The symmetry is key as well, with matching tables and lamps. Beautiful! It's the dream, isn't it? 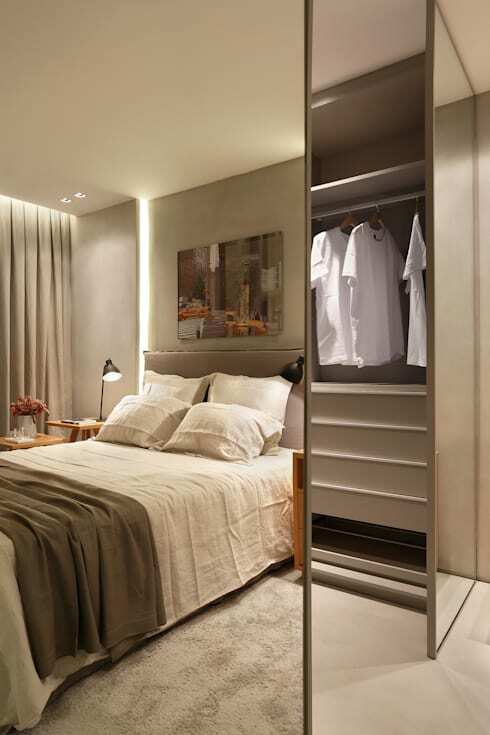 To not only have enough storage, but to actually enjoy a walk-in wardrobe! Hidden behind mirror panels, this one is so stealthy, classy and subtle. 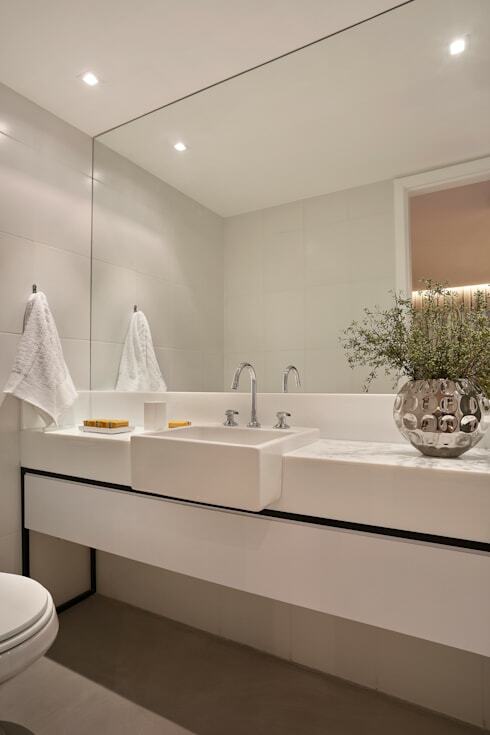 Following on from the walk-in wardrobe is this simple but chic en-suite bathroom. Having everything within easy reach is so critical for a good flow of energy and this first tryptic of spaces really work together. How can this room be so much fun and yet still be as elegant as anything? 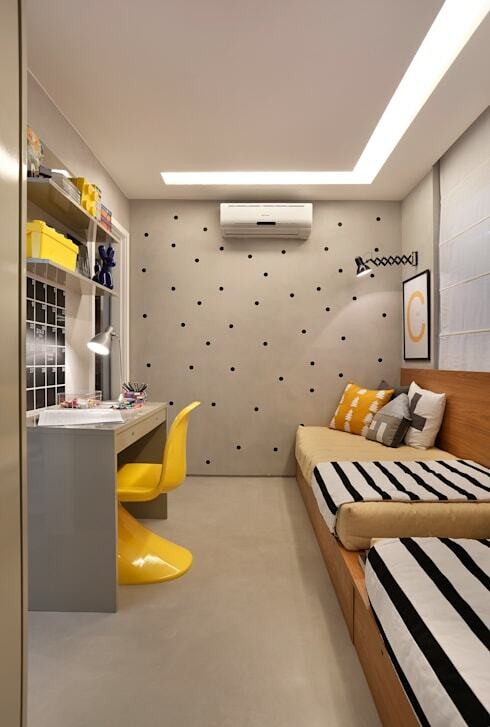 The use of monochrome as the main colour scheme, with yellow accents has brought the whole space to life and that desk! Its so cool that you'd WANT to do homework. 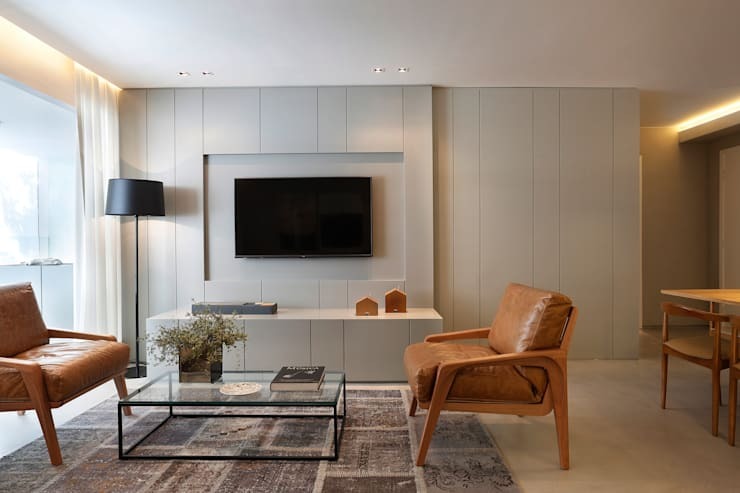 Classic, with a little bit of retro flair, this living room ticks all the right boxes, but when you add in the open-plan theme, suddenly, it becomes something really special! Can you feel the ambience? It's so welcoming, restful and considered. Amazing! Blink and the kitchen can be gone, with this amazing pull-out wall divide! The ultimate in innovative open-plan home accessories, you can enjoy privacy when you want and full openness when you don't. It's a great addition for when you're preparing smelly foods that you don't want to permeate the furniture! Just look how skinny this movable divide actually is! It slots into the wall with not even a hint that it's there, but offers perfect division when in use. What a great design. 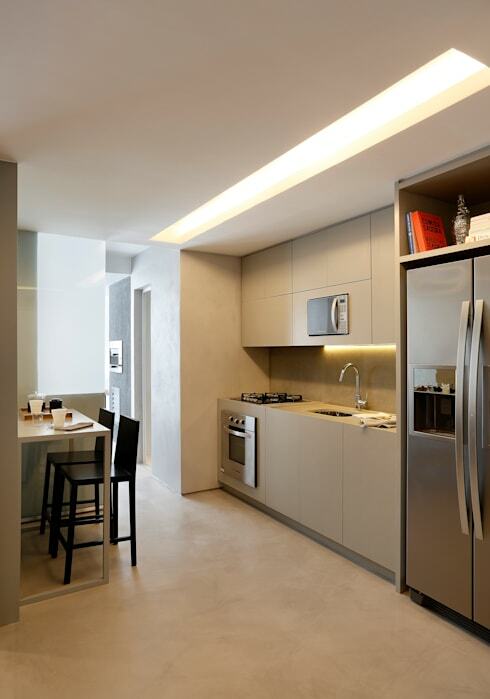 The smooth lines, ceiling lighting and millimetre-perfect built-in cabinets have all created a seamless and spacious room here, that can even accommodate a sweet little breakfast bar as well. The choice of colours here is so lovely too, as it really complements the neutral décor everywhere else. A stunning and useful terrace. Now here's a genius extra touch! 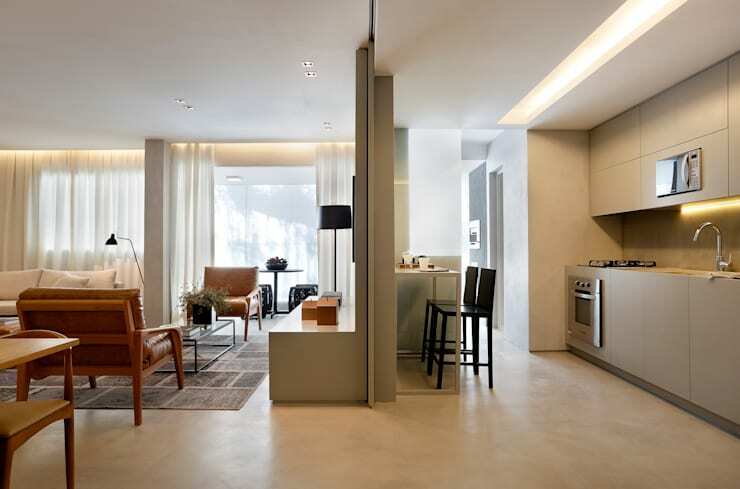 By turning the balcony into an extension of the kitchen, the space is so much more usable and the kitchen itself has been dramatically enlarged. With no weather concerns, thanks to a solid roof, an entire extra room has, essentially been added. 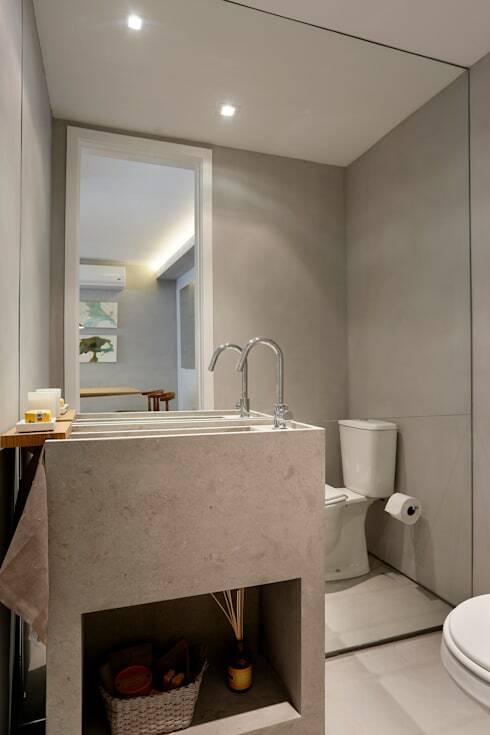 The en suite here was beautiful enough, but this main bathroom certainly isn't pulling any style punches either. Crafted from concrete, the sink vanity unit is a triumph of minimalist chic and keeps the consistent simplicity running through even the most perfunctory of spaces. Wow! What a home! For more minimalist home inspiration, take a look at this Ideabook: 36 minimalist style ideas that only people with taste will love. 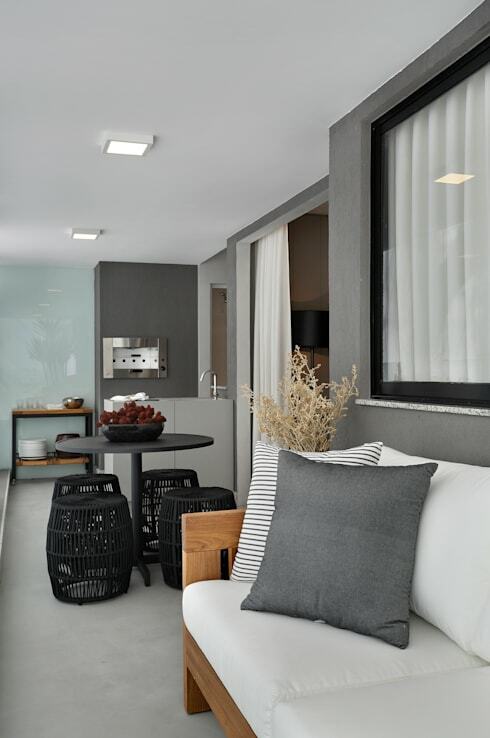 Did you love how elegant and calm this apartment felt?